Duke dominated women's college basketball, compiling a 32-1 record entering a Sweet 16 game against a young Rutgers team. 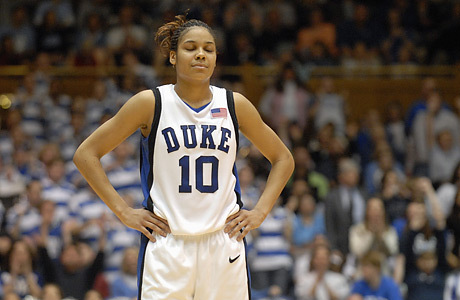 With her team trailing 53-52 with 5.6 seconds left, Duke's Lindsey Harding, the ACC Player of the Year, stole a pass, drove to the basket and was fouled with .1 second left. Two foul shots followed: She needed to make one to tie, two to win. Harding missed them both, and lay distraught on the floor. Rutgers went all the way to the national championship game and was dragged into a national scandal after Don Imus made racist and sexists remarks about the team's players.